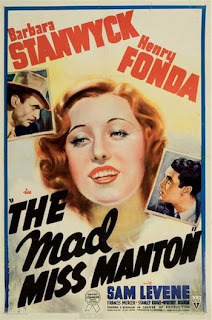 A few years ago WB released a Barbara Stanwyck collection which included a few unknown and strange choices but did not include perhaps the best of her films in their library - "The Mad Miss Manton", a 1938 RKO comedy. They have since relegate it to their Archives where they charge films at $20 plus tax plus shipping. However, they don't ship outside the US (why?!) nor do they allow download if you're not in US soil (again, why?!) so fat chance of me ever getting it like that. Fortunately, the rights of RKO films have been licensed to a multitude of companies all over the world and, in France, Éditions Montparnasse has released a passable DVD release (to be honest, I wonder how much different it is from the WB Archive) at a much more agreeable €10 each. And it arrived today, providing me with a few good laughs and a smile throughout. Barbara Stanwyck is Melsa Manton, a socialite who finds a dead body and calls the police, only to find out that said dead body had disappeared. Intent to make a point, she proceeds, along with a flock of socialite friends, to play detective. There is also a newspaper editor (Henry Fonda) that sets himself out to discredit her and proceeds to change his mind, deciding instead that she must marry him. Scripted by one of the Epstein brothers (who co-wrote, among others, "Casablanca") it's full of quick, witty dialogue - I suggest a visit to IMDb's page of memorable quotes at your own peril, as a couple may give away a bit of the plot. The film also works well as mystery, unlike "Footsteps in the Dark", in that you really can't guess who the murderer is until the very end. Not that matters; it's pure McGuffin. Stanwyck and Fonda have great chemistry together, as anyone who has seen "The Lady Eve" knows. But the dynamic here is quite different, for two reasons. The obvious first is that he pursues her, rather than the opposite. The second is that none of the characters need to fall from their pedestal or let their hard façade drop in order to be happy, as they do in the Sturges' film. The characters' romance is far gentler in tone, perhaps less original than in the latter film, but still brought to life with charm by the leads. Hattie McDaniel delivers one of her best performances as the untamed, hilarious and scene-stealer maid. She has some of the best moments of the film including refusing to serve food to her employer's guests and throwing water on Henry Fonda face and then saying she was only obeying orders. I have always a soft heart for Hattie and it's a pity that she was hardly ever allowed to so something different. I know only of one exception, "In this our Life". Finally, I have to say I love the "character" of the flock of Melsa Manton's friends. There are quite a few of them, eight or so, but they do act as a single character. I didn't recognised any of the faces, but they were perhaps the most original screwball element of the film and for that they deserve some credit. PS - Doesn't poster (above) have the most unflattering portrait of Barbara Stanwyck ever? This movie is a favorite of mine - I love the gaggle of girls running around in furs. I agree the poster is gastly! I love this film! It makes me wish that Henry Fonda had done more screwball comedy. It's great fun.